Four trends that will impact how your center engages with customers in 2018 and beyond. The following are some of the main trends impacting how companies will engage with customers via the contact center in 2018 and beyond. 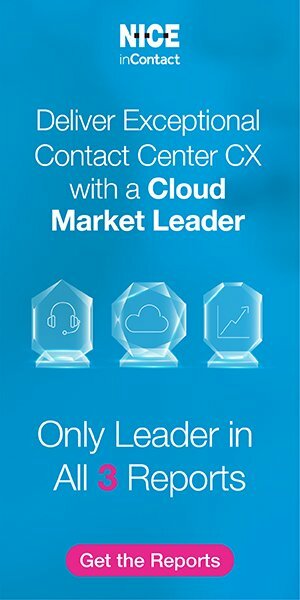 By 2020, 40% of contact center seats will be cloud-based. The data resulting from omnichannel customer interactions—today across chat, phone, text and email—is vast and ever-growing. The cloud is rapidly gaining ground in the core contact center market for its ability to offer the computing power needed to process this data in real-time, which will only continue to accelerate. This data offers immediate insights that will enable more predictive capabilities that can be used in many ways. For example, companies can match the agent best suited to the customer based upon their history and behavior. Ultimately, this will result in an enhanced customer experience. Companies will be looking for a solution that helps them understand which data has the most value, uncover previously intangible business issues and take progressive actions with fresh certainty. Companies will also be looking at interaction analytics across all points—chat, email, SMS, social media—and analyze how they can best utilize the data to improve their business and their customer experience. This predictive power is combined with human interaction in what we at Genesys call “Blended AI” to deliver the kind of hyper-personalized experiences consumers will increasingly demand. We believe 2018 will be the year organizations invest more in self-service and speech recognition technologies to address pain points. In addition, we predict chatbot use in the contact center will grow, freeing agents to deal with more complex queries and higher value transactions. AI could potentially disrupt the jobs of 1 million phone-based customer support agents by 2020. But moving ahead with AI-only or bot-only strategies is near-sighted. AI is used at its best when it supplements and extends the capabilities of human agents. AI and bots are still unable to replicate the human touch necessary to handle complex and/or emotional issues. Companies that find the right blend of humans and machines, rather than using bespoke choices, will be much more successful going forward. In 2017, there was little simultaneous use of engagement channels, such as chatting and browser sharing, or using the combination of a chatbot and live chat. But thanks to the growing popularity of virtual assistants such as Amazon Alexa and Google Home, consumers are becoming used to AI voices and are more accepting of interacting with chatbots when they reach out to a contact center. In many cases, for simple requests, they even prefer it, as long as they don’t become trapped in fully automated interactions with no way out. By 2022, it will be far more common for a video-based customer support agent to also share the user interface, or for a chatbot to be used by the customer support agent while conversing with the customer. Though the proportion of phone-based communications will drop, a human agent will still be involved in 44% of all interactions. AI shouldn’t replace customer service and support staff, but rather help them solve customer problems and answer questions better, faster and more efficiently. In just a couple years’ time—by 2020—messaging will be used more than voice and chat combined. Chatbots on Facebook Messenger, WeChat and LINE, for example, can offer consumers typical self-service capabilities right within the communication channel they already use with their friends, colleagues and family. Businesses cannot efficiently keep up with consumer’s ever-increasing demands for service on these popular touchpoints without leveraging chatbots. As bot technology evolves, organizations will be better positioned to seamlessly deliver an omnichannel customer experience. The same bot platform can now embrace all channels and ensure consistency in bots’ response across voice, chat, messaging and more. For example, a customer can call into an airline’s interactive voice response (IVR) and ask several different types of questions such as: “How many airline miles do I have?”; “Can you help me book a round-trip flight from Heathrow to O’Hare the morning of February 17 using my airline miles?”; and “What is your cancellation policy?” At any time during the interaction a customer can say, “I want to talk to a human,” and the solution will seamlessly connect the caller to a customer service agent. Augmented Reality (AR) will hit the big time before Virtual Reality (VR) does because it’s much more accessible. A big development for the AR experience is in Blended AI where AI engines direct real-time interactions. At the moment, AR is predominantly app-based. That means everything that is going to happen for AR experience is predetermined within the related app. Whereas when AI drives the AR experience, the customer gets a customized experience based on who they are, where they are, the physical relationship of a mobile phone to the object, image recognition that reveals what they’re looking at, and data pulled in from other sources’ interactions or questions about the object. The result? A whole new layer of intelligence effectively meshing over the real world. AR has tremendous promise to enhance customer self-service, especially for instructional scenarios. For example, think about a consumer whose router won’t work. They could just point their phone at it and AR instructions would pop up, overlaid on the router in three dimensions. “Have you pressed this button?” “Is this light blinking?” and so on. Simple, but incredibly powerful. There is also no reason a similar holographic entity couldn’t become the customer support agent of the future. Why talk to a disembodied voice when you could see a realistic projection of that person using visual indicators to show you how to install your new router? Princess Leia may be in a galaxy far, far away, but the technology is not.